This is a great dish that utilizes all that beautiful corn you can find at the farmers’ markets through early fall. It’s great served on the cob for more informal dinner parties. However, you can certainly make this into an elegant side dish by cutting the kernels off and creating a warm salad out of it. Corn can be prepared on the grill or under a broiler. 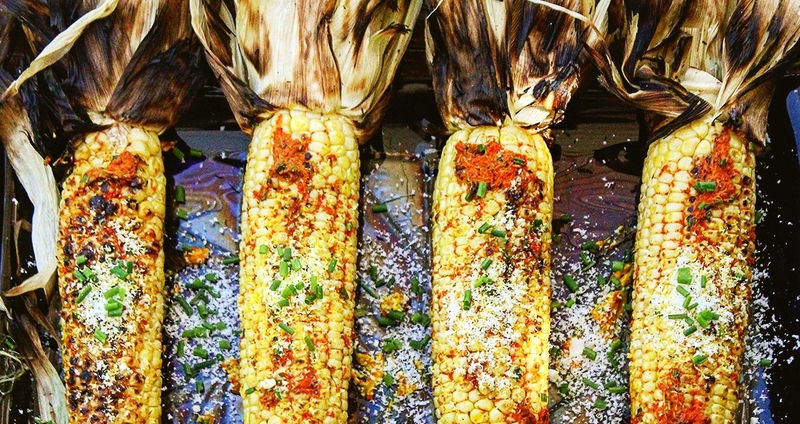 Place corn (in husks) directly onto preheated grill or on a baking sheet under your broiler. Turn every 5 minutes until corn has par-cooked. Remove from heat and allow to cool slightly. Peel back husk and rub oil onto exposed corn. Place back on grill or under broiler and keep turning until corn has charred slightly (that’s different than burned). Remove corn and rub with marigold honey butter. Present on a platter and sprinkle with chives, optional chopped cilantro and finely grated mizithra cheese. Serve with lime wedges. Allow butter to soften to room temperature. Meanwhile, finely chop flower petals. Combine all ingredients in a mixing bowl and gently mix to combine. Can be made a couple days in advance.